The Velcro attachments make attaching and releasing this top tube bag quick and easy so you can take it with you after your done biking. The soft grip base keeps the bag from sliding around on the top tube while not scratching the bike paint. 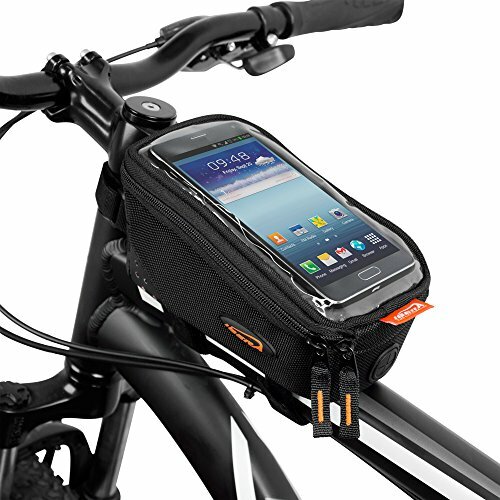 Ibera innovative top tube bag design with a clear pocket on top for a phone is the perfect bag for a ride to work or around town! The pocket on top allows for quick access, and has a specialized earphone opening so you can listen to music or to your phone while riding. Multiple compartments store items such as a wallet, keys, snacks, tools, etc. And the phone pocket can fit phones up to a 5 - 6 in screen size! Carry Limit: 4.41 lbs (2 kg). Specialized earphone opening so you can listen to music or to your phone. Soft grip base keeps the bag from sliding around on the top tube while not scratching the bike's paint.